There is for you an excellent example (to follow) in Abraham and those with him, when they said to their people: “We are clear of you and of whatever ye worship besides Allah. We have rejected you, and there has arisen, between us and you, enmity and hatred for ever, unless ye believe in Allah and Him alone”: But not when Abraham said to his father: “I will pray for forgiveness for thee, though I have no power (to get) aught on thy behalf from Allah.” (They prayed): “Our Lord! 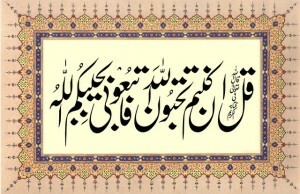 in Thee do we trust, and to Thee do we turn in repentance: to Thee is (our) Final Goal. This entry was posted in B. Praise worthy morals, C. Blame worthy Morals, E. States, J. Rights on October 30, 2009 by 'abd.